He was waiting on a side street in Ancienne Medina. He wanted to go to Rick’s Café but she had other ideas. Even Daniel had to admit that visiting the only Jewish Cemetery in the Arab world was a novelty. She wasn’t looking for novelty, though. She was looking for their older brother. Abdul ignored the young Jew loitering in the alley as he left for work. I wrote this for the What Pegman Saw flash fiction writing challenge. The idea is to take a Google street maps image of a specific location and use it to inspire a short story no more than 150 words long. My word count is 147. Today, the Pegman takes us to Casablanca, Morocco. Yes, there were a string of suicide bombings in Casablanca in 2007 (the Google image was photographed in July 2016 so that’s when I set this story) and there is a Jewish Museum as well as a Jewish Cemetery there. There really is a Rick’s Cafe in the city styled to resemble the establishment featured in the 1942 film Casablanca starring Humphrey Bogart, Ingrid Bergman, and Paul Henreid. 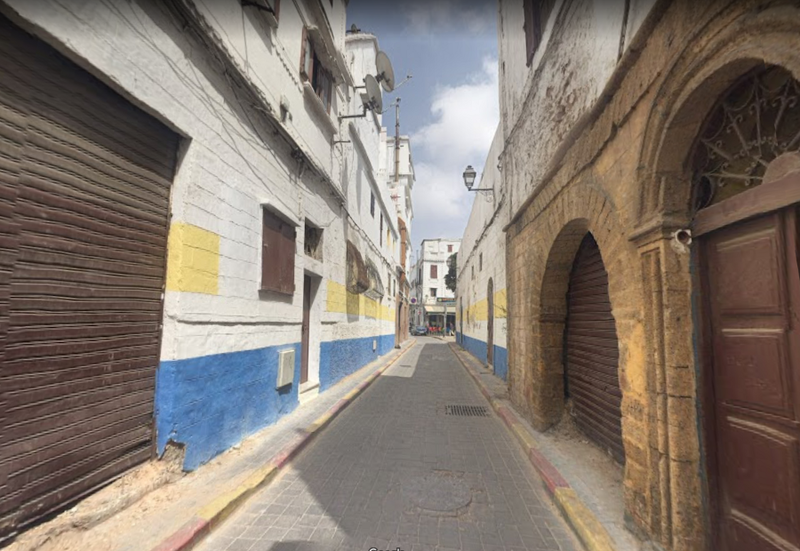 Casablanca has such a colorful history that it was hard to decide which sort of story to write, but I focused on the Jewish history of the area and its possible consequences today. No, the fact that today is Yom Kippur hasn’t escaped my notice. I originally had Daniel killing Abdul in an act of vengeance, but I’ve written stories like that before. Today is Yom Kippur, the Jewish Day of Atonement. Religious Jews all around the world spend the day in the synagogue fasting and praying. It is said that if you have sinned against God and ask His forgiveness, He will forgive, but if you’ve sinned against a person, you must ask that person’s forgiveness before God will forgive (even if the person chooses not to). I decided that my protagonist should take the moral high road. “Let it end with me” is the message from your story – and in this case, it succeeds. There is one less killing; there is an end to this particular cycle of terror. If humanity is to survive, we all need to learn to say those words. It’s not an impossibility but a necessity. I agree in principle Penny, but the next bomb will always go off somewhere and a new cycle will begin. There must be an end…but let Mashiach come, and end it…permanently. Such a wonderful message. Love how you were able to weave in so much of the Casablanca history in your story. Thanks. It’s a place with a lot going on. Such a condensed story, James, and like everyone above, I love that line, which shall be practised. Thanks, Kelvin. I’m glad I changed my original vision for the story. Works much better this way. I saw Rick’s cafe on the map I downloaded an image of – and did not realize it was fashioned after the movie – good idea for a business to do this – to give folks a destination place! Part of what I read in my research is that Casablanca has become a popular tourist destination, so Rick’s is only one of the attractions. well that makes sense- a good idea to bring action to the town. It reminded me of how the people who owned the Paris cafe that Vincent van Gogh painted decided to make it a tourist destination. – and it is win win cos somehow we people get to connect to something we love and business people make moola – or hope to. Great line delivering a great message.